Diving into the genre of young-adult film adaptations is a dangerous proposition these days. “Harry Potter” and “The Hunger Games” are two of the biggest film franchises there are and cross all demographics. “Twilight” is more female-oriented and less critically acclaimed, but is also a box-office juggernaut. Even though this year’s “Divergent” may not be on the same level, only an idiot wouldn’t call it a hit with major potential. Yet there have been numerous bodies left in their wake. “The Mortal Instruments: City of Bones,” “Beautiful Creatures,” “The Golden Compass,” “Cirque du Freak: The Vampire’s Assistant,” “I Am Number Four,” “The Seeker: The Dark Is Rising,” “Lemony Snicket’s A Series of Unfortunate Events,” “City of Ember,” “Stormbreaker,” “The Spiderwick Chronicles” and more. 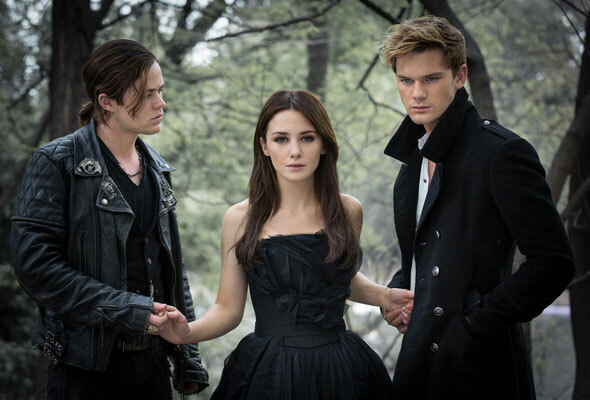 Today, Yahoo has premiered the first photo from the latest to give it a go – a film adaptation of Lauren Kate’s book series “Fallen”. Some familiar formula traits are here – a pale, indecisive 17-year-old girl is sent away to a reform school where she becomes torn between the eternal love of two handsome young guys who are rivals and supernatural creatures (in this case fallen angels). Addison Timlin, Jeremy Irvine and Harrison Gilbertson star in the Scott Hicks-directed adaptation which is due for release some time in 2015.